The loving potential of every young child is a potent source for good in the world. Our aim is constant in trying to reach all children in poor, malnourished, and deprived circumstances. Our vision is a vibrant, self-supporting Kylemore community, where human dignity, self-respect, personal contribution, and community esteem are the norm… and growing to encompass the surrounding communities. Our mission is to offer a holistic way of restoring natural and human communities, thus brightening the outlook of the world we share. Through self-help and taking responsibility for one another, we aim to improve the quality of childhood and enable independent income earning opportunities for young people and adults. 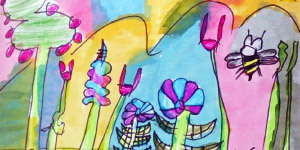 Buy child art to brighten up your home and offices. Select a piece of child art today and make a difference to the lives of our aspiring artists in Kylemore. We have an ongoing school feeding scheme of one nutritionally-enhanced muffin (baked on the premises of the high school) and a cup of soup provided to the poorest children on a daily basis. A contribution of R100 (€10) per month provides a muffin and cup of soup per day for one child, as well as contributes to their early childhood development. Through the sponsors of our Educate a Child programme, Imbali provides for the school fees, uniforms, full day care, and other schooling needs of under-privileged, vulnerable and orphaned children. By donating R200 (€20) per month per child, you can support a child's learning, and make a difference for life. We send out an occasional newsletter via email, detailing our latest news and activity. Complete the form below to join our mailing list. Copyright 2009 - 2019 Imbali Western Cape. All rights reserved.